Wesleyan's new monogram design garnered more than half of the 6,200+ votes cast by members of the Wesleyan community. The winning design was submitted by Gabriel Drozdov ’19, theater and computer science double major. Read more about the monogram design and Gabriel Drozdov in our Connection Newsletter. In the coming months, you'll start to see the monogram appear as a short-hand version of Wesleyan's wordmark on the Wesleyan website, in social media and on apparel. We're grateful to those who submitted designs, and to the more than 6,000 members of the Wesleyan community who cast their votes for the next monogram to represent Wes. Wesleyan is unique. But higher education and the web are increasingly crowded and competitive spaces. To continue to effectively attract students, faculty, and staff that make us special and showcase our accomplished alumni, Wesleyan must differentiate itself. One way to do this is by adopting a shorthand icon that cuts through the clutter and honors our storied history and exciting future. For the past three years, we have been using a generic Trajan Pro W font for our social media icons. While that mark has served us well, it doesn't capture the full range of the Wesleyan experience in a way that helps us stand out. So, we've sought ideas from our broader community to create a unique "monogram" that can be used as a shorthand version of our full Wesleyan University wordmark. This monogram could take any form: character-based like the current W; a graphical element like Foss Hill; or something completely different. It will appear across Wesleyan's digital footprint — including our social media accounts and website — as well as in analog fashion, on items like banners and clothing. We've come to understand that the best way to develop a truly representative mark is to engage our community's creativity and incorporate their feedback. We accepted submissions from anyone directly affiliated with the Wesleyan community for our new monogram. 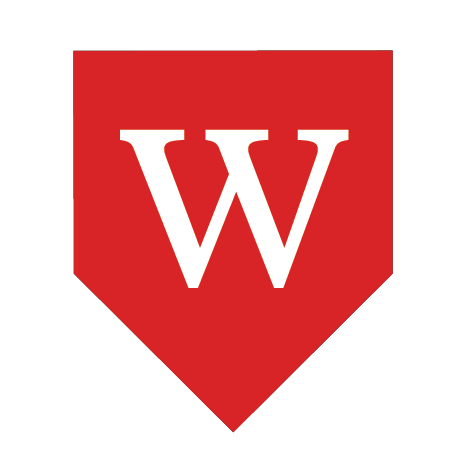 The design challenge was to create something uniquely Wesleyan — to set it apart from the nearly 200 other colleges and universities that start with the letter W and around 20 with Wesleyan in their names — as well as something flexible enough to work with current and emerging formats like small screens and handheld devices. It must also have the potential to work at scale (as on a large banner). Individuals were encouraged to submit up to five different ideas for the monogram, following the base criteria specified on the submission page, as well as the existing Wesleyan design standards. Submissions were narrowed down to a group of finalists by a committee of student, faculty, staff, and alumni. Jonathan Turitz ’86, Chief Marketing Officer, D’Addario & Co.